We are giving three readers of TheaterByte a chance to win one (1) of three (3) copies of the thrilling Hong Kong action film Firestorm on Blu-ray Disc. In his review of the Blu-ray, our very own Brandon DuHamel said “Andy Lau and Gordon Lam put on riveting performances in this non-stop shoot ‘em up film, acting as the glue that holds the thinly woven plot together.” See below for further details o the Blu-ray Disc and on how to enter for a chance to win Firestorm on Blu-ray Disc from Well Go USA Entertainment. PLANO, Texas. 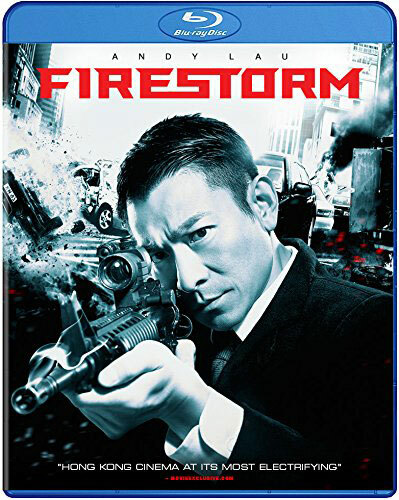 (July 29, 2014) – Hong Kong action icon Andy Lau (Infernal Affairs, House of Flying Daggers) stars in Director Alan Yuen’s (Princess D) action-packed crime thriller FIRESTORM, igniting on Blu-ray™, DVD and Digital Sept. 23 from Well Go USA Entertainment. A hardboiled police inspector (Lau) must confront, and cross, moral lines in order to hunt down a crew of seasoned criminals. Rounding out the cast are Michael Wong (Triple Tap), Ray Lui (Transformers: Age of Extinction), Ka Tung Lam (Drug War, IP Man), Jun Hu (Bodyguards & Assassins), Chen Yao (Caught in the Web), Vincent Sze (Vengeance), Chi-yin Wong (Life Without Principle) and Shing-Ban Lam (Young and Dangerous: Reloaded). A storm is heading toward the city of Hong Kong, threatening the lives of everyone in its path. As citizens scramble for cover, a crew of seasoned criminals stage a series of armored car heists in broad daylight, showing no mercy to anyone who gets in their way. Hardboiled police inspector Cao Nam (Andy Lau) has had enough. He vows to take back his city, but quickly learns that regular police tactics are no match for the thieves’ unmerciful brutality. The more Nam pursues them, the more unhinged he becomes – and the savage confrontation brewing in the streets may leave an aftermath even more horrifying than the devastating effects of nature itself. FIRESTORM has a runtime of approximately 110 minutes and is not rated.